I don’t know if you remember – but early this year in Taking a stab at by bookshelves, I wrote about my Read a book program. 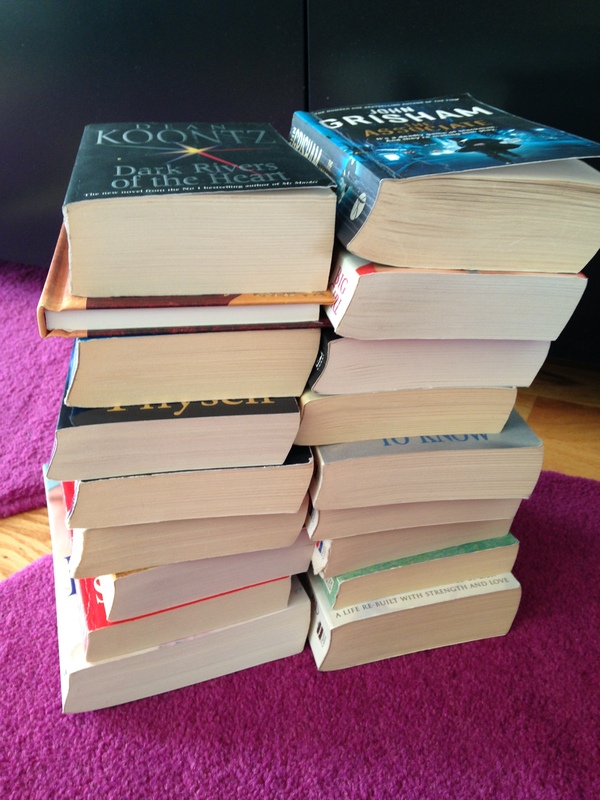 How I’m planning on reading my way through my books, to decrease the collection I keep. That means that today, 18 books are going out of the house. As soon as the weather is good enough to start my garden projects, I won’t get much reading done.. but for right now at least, I’m on a roll, so I’m hoping for one more pile of books this spring. What about you, how do you handle your book collections? I am still putting off tackling my books! It took me forever to finally toss books! I don’t tend to reread books so when I’m done with books I sell them to stores in the US such as Half Price Books and get a little cash back. I am getting my kindle in a few days! Hurra!!! I am already looking up which books to read on it, there’ll be a few that will compete to be the first kindle book for me 🙂 I have read all the books I’ve borrowed from friends to be able to give them back quickly, and from now on all that I read will leave the house afterwards. But, hard work indeed! I’ve started rereading my collection in between book club books and here’s what I’m finding: some books on my shelves I pass over when selecting because they don’t grab my attention…isn’t that a dead giveaway that those books should be, well, giveaways? Duh. Recently reread “The Red Tent” by Anita Diamant and currently rereading “A Heartbreaking Work of Staggering Genius” by Dave Eggers…definitely keepers! We had, at my old work place, every now and then “book changing days” where we all brought books to work and then every one could also pick and take home books from others. Very practical! Here some libraries also have “donate book shelves” where you can leave your old ones. I could never throw books away but this way I can create room in the shelves! Somebody somewhere would enjoy that book. I agree, I don’t like shredding them either. I’d rather they get used. Most of the 18 went to my mum, one to a friend, and only two if them are left to be disposed of. oh well, maybe someone will like to have them. Do you have a goodwill store or hospice where you live? I always take my books there as a last resort. Oh, I get it now. I only know English too, but I’m still in the USA. 🙂 I’m actually a Norwegian, I just prefer to read English books. I’ve only got about 10-12 Norwegian books, everything else is in English. I love books if you don’t want yours I will definitely take them.